Coming in April: HBO’s "Saving Pelican 895"
Next month HBO’s documentary Saving Pelican 895 will debut on cable. Its directed by Oscar nominee and Peabody winner Irene Taylor Brodsky (HBO’s “The Final Inch” and “Hear and Now”). The movie tells the gripping story of the rescue of a Brown Pelican “LA 895,” one of the many oiled bird victims of the 2010 BP Gulf oil spill, cared by International Bird Rescue and Tri-State Bird Rescue response members at the Fort Jackson Oiled Wildlife Rehabilitation Center in Venice, Louisiana. The film features interviews with IBRRC staff and follows the pelican from capture to treatment to its relase back to the wild. We’ll keep you updated on exact April 2011 viewing times. It’s been a busy few weeks here at IBRRC and we forgot to post this really great video produced by Jean Shirley, one of our super volunteers in Northern California. She captures the sights and sounds of a busy wildlife hospital during our crunch time when we had 480 birds in treatment from the toxic algae event. The bird center has calmed down a bit since this was videotaped, but volunteers are still working with the algae birds. So far 245 have been released back to the wild. 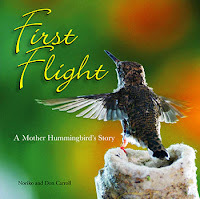 If you’re looking for a remarkable nature documentary for the whole family look no further than the “Hummingbird: First Flight: A Mother Hummingbird’s Story” by Noriko and Don Carroll. The Carrolls have created a beautiful, high quality 45 minute video that follows a mother hummingbird from the moment she lays two eggs until her little babies fly out of the nest for the first time. The tiny hatchlings were named Ray and Zen. The mom is called “Honey” and she’s a Black-chinned Hummingbird. It was filmed in their Las Vegas, Nevada backyard. The “how they made the video” ending is fascinating and full of ideas for those interested in documenting bird life. Some staff members from IBRRC saw the video earlier this month at the Blue Planet Film Festival in Santa Monica. The film is available online to purchase at the couple’s website for $19.95. The husband and wife team also created the excellent book on the same subject. See it on Amazon. Release of 6 birds back to the wild at Santa Monica Beach as part of the Blue Planet Film Festival. Thanks to Paul Kelway for the video work. After being plucked from a huge utility towers in the South San Francisco Bay, double-crested cormorant chicks are being reared and eggs incubated at IBRRC’s bird center in Northern California. This is the second time we have raised and rehabilitated baby cormorants from eggs. Last year, we raised a small batch of cormorants and had about a 60 percent release rate of wild, healthy juvenile cormorants. 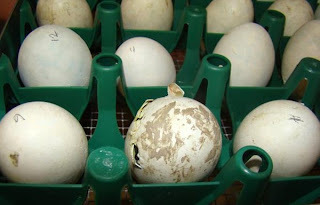 In the beginning of the video, you can see our large egg incubator. Next you see the youngest chicks, several days old, being fed in an incubator in our ICU unit. They are born naked and blind, but now their eyes are beginning to open. To avoid habituation with humans, we put on a black cape before we feed the chicks. As the one behind the camera, I am also wearing a cape. The next video clips show increasingly older chicks. The oldest ones in this video were taken from an outdoor cage in a special section of our Pelican Aviary to one of the inside cages, where they will spend the night. “I am a local (Venice based) film director. The other day I was shooting on the beach and I got some great footage of a sick pelican and his subsequent rescue by one of your volunteers. Tao Ruspoli in Southern California took this video and sent it to us after seeing a [adult, winter plumage] pelican in distress. A member of the Marine Wildlife Rescue team scoops up the bird and takes it to IBRRC’s San Pedro bird center for treatment. Thanks Tao for creating this great Public Service announcement (PSA). Every time you take a breath, thank the ocean and phytoplankton. At least half the world’s oxygen output comes from the sea by way of the tiny, drifting marine animals and plants called phytoplankton. During photosynthesis, the microscopic lungs of the earth, phytoplankton use carbon and returns oxygen to the water and atmosphere. Not only does plankton provide O2, it also is the start of the food web that allows fish, birds and mammals to proliferate. The group Greenpeace has a terrific “Lungs of the Earth” video underscoring this important aspect of the sea. The group is trying to remind us that oceans get too little credit for their oxygen production, as well as their capacity to absorb CO2. Phytoplankton production is good indicator of environmental change, too much plankton can be deadly for birds and other animals. These blooms often result in domoic acid that affect animals central nervous systems. The ocean is a balance, do your part by keeping it clean. Another group of young pelicans were released back into the wild by IBRRC volunteers this weekend at Fort Baker near the Golden Gate Bridge. Most if not all of these brown pelicans had been rescued from collision of birds and anglers off the Santa Cruz County coastline in August. A lot of the pelicans came in with fishing tackle injuries before authorities closed the fishing piers in the Santa Cruz area. Here are our five beautiful brown pelicans being released near Fort Baker. Quite a crowd had gathered in the parking lot on the higher level. All were quiet and respectful. There were many smiles. John did the release. He wasn’t sure what to do when the first two pelis wouldn’t leave their carrier. He tried gently tilting the carrier. That didn’t work, of course. Then he tried to prop the carrier door open so he could go open the next two carriers. By that time, the first two had worked up their confidence and ventured out, followed by the others. The last to leave wasn’t sure…. He hung around for a little while, trying to make up his mind. We gave him as much time as he needed. And then he must have seen the others, and he took off. I was glad to see that all five were reunited in the water. Thanks to Jean for the video report. Here’s another awesome video of young pelicans feeding at Capitola Wharf in Santa Cruz County from videographer extraordinaire, Rebecca Dymytryk Titus. The wharf is now closed to fisherman. Earlier in the week officials finally had the gumption to shut the pier to prevent further injury to pelicans becoming entangled in fishing line and hooks. IBRRC is still treating 60 injured pelicans caught in fishing line in a standoff with local fishermen. We arrived at the Cement Ship fishing pier on Seacliff Beach to find thousands of birds near shore feeding on bait fish (see video above). We did see three pelicans with line, none we could approach for a successful capture. It was good to see the ship was closed to fishing and people, for the most part, we’re letting the birds be. Found a tangled or weak bird that needs immediate care? Please call the wildlife hotline at 866-WILD-911. IBRRC is treating a high number of young pelicans caught in fishing line and long-line hooks. Both of our centers are overwhelmed with birds in car. The fish bill alone for this crisis will cost us $20,000. If you can help us with a donation, please do so. Donate now or adopt-a-pelican. Thanks! It’s another busy summer season for the staff and volunteers at Bird Rescue as sick and starving young pelicans arrive for treatment at both California centers. Since June nearly 100 pelicans have been transferred to the bird rescue centers – one in San Pedro and the other in Fairfield, CA – to be given the best possible care. Starting in May 2008 an overwhelming number of pelicans competed with fishermen for large quantities of schooling fish in Northern California – especially in the Santa Cruz/Monterey Bay areas. We began receiving an extraordinary influx of pelicans with entanglement, fish hook and tackle injuries. We were receiving 10-12 birds a day until California Fish and Game stepped in to close the local piers to fishing. You can also become a Pelican Partner. With a donation of $1,000, you will have the chance to tour one of our California wildlife centers and help to release one of our patients back into the wild. This experience offers supporters a special opportunity to see a seabird getting its final medical exam and numbered leg band, and the once-in-a-lifetime honor of opening the cage at the release site as your partner pelican takes its first steps into the open and soars away. Luckily this year Bird Rescue completed construction of a new 100-foot pelican aviary at its Fairfield, CA bird center. The aviary allows pelicans to recuperate in large comfortable setting. It has two large pools and perches for the birds to fly back and forth to stretch their wings. The aviary was completed with funds from the Green Foundation and the Oiled Wildlife Care Network (OWCN). 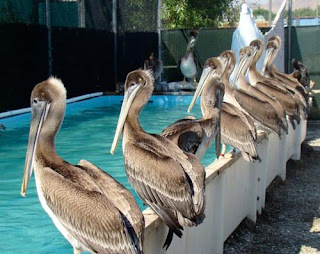 The San Pedro center has had a pelican aviary since it opened in 2001. Found a bird? How to handle a sick or injured pelican or other aquatic birds. Marie Travers of IBRRC’s Northern California bird center pointed me to a really beautiful video of the Frigatebird released on Catalina Island in Southern California. There have been nearly 2,400 confirmed deaths since the Cosco Busan container ship struck the San Francisco-Oakland Bay Bridge on November 7 and spilled 58,000 gallons of bunker crude oil. At least 1,750 arrived dead following the spill. Another 650 died or were euthanized during care at the OWCN/IBRRC Cordelia bird center. 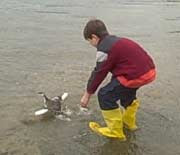 My thanks to IBRRC volunteer Jean Shirley for the bird release photo and video.